Dear Visitor, To gain Good merits and invoke blessings for you, Please Email the link, to your friends or relatives who may like to listen to these excellent Dhamma Audio Discourses. The greatest gift any body can give to an other is the Dhamma. (Sabbha Danam Dhamma Danam Jinathi). The First Discourse of Buddha. 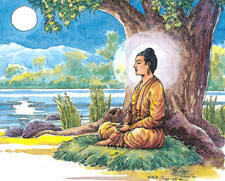 Having realized the Four Noble Truths - the Truth of "Dukkha" (Suffering); the Cause of Suffering; the Cessation of Suffering; and the Path leading to the Cessation of Suffering (or else the happiness) - by himself, the Buddha decided to teach it to the five ascetic Brahmins who were earlier with him at Uruvela, in Buddhagaya. At the end of this First Discourse, which is now known as the "Dhammacakkappavattana Sutta" and given to these five ascetics Brahmins who were at that time living at Isipatana in Benares. The oldest of ascetic Brahmins, Kondanna, who was well versed in all the Vedic scriptures was able to understand and grasp the Buddha's first Discourse "Dhammacakkappavattana Sutta" very easily with no difficulty at all. Thus becoming the first person to realise the first path and he became a Sotapanna, or one who goes against the stream of Samsara (the recurring cycle of life and death). To be able to listen, the first time users may have to spend 2-3 minutes installing Live 365 player (Audio). Buddhist attitude towards death and life (In English -(Audio) By Australian Monks - Audio) and more..
P.S Some listeners from USA informed me certain Sinhalese audio links are not working at times. In such cases click here Savanata Sisilasa is the original broadcasting station. Follow the instruction on that page how to install the "365 Player". You need to install it once. Before being able to listen. After that you can listen at any time you feel like it. Now, everyday you can listen to a new discourse. 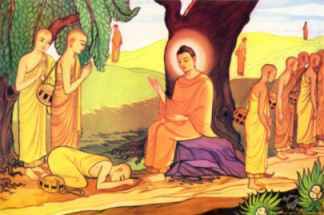 How the Buddha died by Venerable Dr Mettanando Bhikkhu Bangkok Post, May 15, 2001. 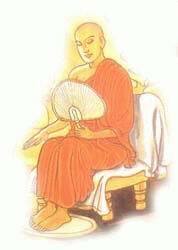 Dr Mettanando Bhikkhu was a physician before entering the monkhood. Contains hundreds of links to good high quality web sites related to Vedic traditions, such as Yoga, Vastu, Ayurveda, Jyotish, Hinduism and Buddhism. It is more than two millennium and a half now since the great teacher and a prince by birth later known as the "Buddha" walked the ancient land of India. Even today Billions of people all over the world Buddhists and non Buddhists accept Buddha's teachings in their life. And there is no doubt that Buddha is one of the greatest sons India has ever produced. But it is a great pity to see that many Indians know next to nothing about Buddha, his life or the teachings. It is as shameful as to say that, "I am a proud Indian, but I know nothing about Mahathma Gandhi". Specially for a Hindu to be so ignorant of Buddha.